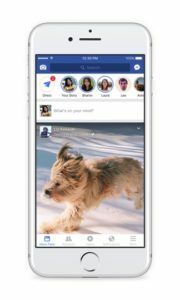 In a calculated roll-out that has been in development for the last year, Facebook announced today that it would be introducing 3 new features to its app to compete directly with Snapchat’s increasing popularity amongst teenagers. 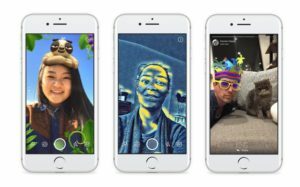 Due to roll out this week, the update seeks to mimic Snapchat’s Stories feature, as well as allowing users to take photos with an ‘in-app’ camera, where photos can be personalised with animations and interactive filters. Sound familiar anyone? Facebook’s Product Manager, Sachin Monga, said the new functions within the Facebook app, reflect Mark Zuckerberg’s belief that the world is shifting away from words and towards visual content. Let’s have a look at the new features. The ‘in-app’ camera that allows users to take photos in Facebook. This camera can be accessed by either tapping on the new camera icon that will feature at the top left corner of the Facebook app, or swiping right from the News Feed. This camera will work pretty much the same way as Snapchat, in that users will be able to personalise their videos/photos through an assortment of pre-existing filters and animations. This new feature, allows users to share individual photos or videos with specific friends for a limited time. Basically the core feature of Snapchat, and its alluring appeal for so many users. 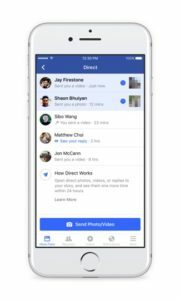 It works exactly the same as Snapchat Stories – letting you share “multiple photos and videos as part as a visual collection atop News Feeds” – Facebook Newsroom. The new features should start appearing on the Facebook app throughout the day.